"The FBS results of the study showed that participants receiving active product dropped over 100 points, from an average starting point of 196.6 mg/dL to 96.5 mg/dL in 30 days. Average starting A1c readings for the active group dropped from 7.70 to 4.66 in 90 days." 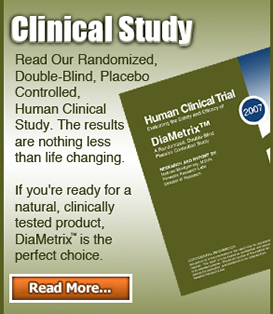 United States of America (Press Release) April 5, 2009 – Portsmouth, NH– Steelbreeze LLC, announced today the completion of its first major human clinical study on DiaMetrix®, a natural product designed to assist the body maintain healthy blood sugar levels. "This study establishes DiaMetrix® as the world's premier product for promoting healthy blood sugar levels” said corporate formulator, Kenneth Hampshire. People with type 2 diabetes measure their level of blood sugar by two main methods: the fasting blood sugar levels (FBS), and the A1c test. The FBS test measures blood sugar at one particular moment in time, while an A1c test measures average blood sugar levels over a 3 to 4 month period of time. The FBS results of the study showed that participants receiving active product dropped over 100 points, from an average starting point of 196.6 mg/dL to 96.5 mg/dL in 30 days. Average FBS levels in the active product group continued to drop through the end of the study, ultimately reaching 89.4 mg/dL at day 90. Study participants taking placebo saw their average FBS rise nearly 8 points, from a starting point of 196.9 mg/dL to 204.9 mg/dL at day 30, and rose slightly to 205.2 mg/dL at day 90. A1c test results were similar. Study participants receiving active product saw their A1c readings drop over 3 full percentage points over the course of the study. Average starting A1c readings for the active group dropped from 7.70 to 4.66 in 90 days, ending well within the range considered “normal” by medical professionals. Study participants taking placebo saw their A1c readings rise over one quarter of a percentage point in the same time period, from a starting point of 7.69 to 7.95. Other metabolic markers showed similar 90-day results with major changes in triglycerides (-20.3 %), cholesterol (-29.1%), blood pressure (-14.6%/-6.7%), and body weight (-9.3 lbs). Lisa Tully, Ph.D. wrote in her peer review "...the DiaMetrix® study met the criteria for the Gold Standard trial, which is the most rigorous standard to meet. 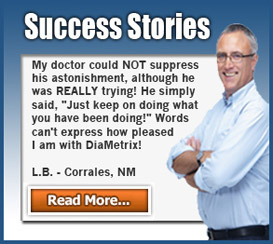 Furthermore, DiaMetrix® produced astounding results..."